Evergreen Total Landscape is the company you can rely on if you need expert Tampa Bay landscaping services. We have been serving the Tampa Bay area since 1983 and our team of knowledgeable professionals can perform virtually any landscape service, including landscape maintenance, Christmas light decoration, landscape design, landscape installation, irrigation maintenance, and more. We even have a certified pest control operator on staff to help keep unwanted critters off your lawn. All of our properties are proactively maintained, meaning we regularly inspect them to ensure the land looks pristine and address any problems that arise right away. We also build relationships with our customers and work to maintain them over time. We want to be your partner in making your dream landscape vision a reality. At Evergreen, no job is too big or too small for us. 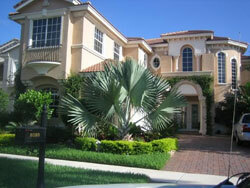 For more information about our Tampa Bay landscaping services, please call or e-mail us today. We also offer services to customers in Clearwater, St Petersburg, Lakeland, and surrounding cities. Evergreen Total Landscaping. Email: info@evergreentampabay.com. Call: (813) 659-2778 | Fax: (813) 659-3228 Internet Marketing by Ntelligent Networks, Inc.